A great addition to exterior holiday décor is Christmas Kingdom’s Christmas Sign offerings. These whimsical signs are available in a variety of sizes and images. The “Merry Christmas” sign is 3.5 metres in length and features the colourful greeting along with images of Santa, holly, and berries. The letters are suspended along a red rope with glittering sparkling gold stars on each of the letters. This would be a perfect piece to hang on a patio, porch or even the front door. Picture it hanging with garland and twinkle lights and it’s sure to make a statement. 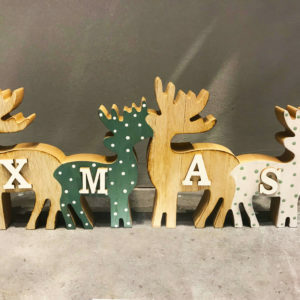 The wooden painted Reindeer LED Stop Sign features the saying “Santa Stop Here,” making sure Santa doesn’t miss a stop! The LED lights make sure that Santa won’t pass by your house this year. The bright white LED lights are battery operated and are programmable to flash or stay solid. There is also another version of the sign available without the LED lights on it. The signs range from $9.90 to $19.90. 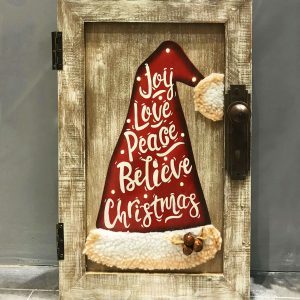 As well there is the wooden painted Santa Stop Sign, featuring the same message “Santa Stop Here.” This sign is also available in two different versions in two different price points. The sign features Santa’s face peeking over the top of the stop sign. He’s complete with a little bell on his red hat with white trim. The LED version features bright white lights that are battery operated and programmable to flash or stay solid. These signs can be placed on the lawn or in the garden or bought in multiples to be placed along a pathway and create a landing strip affect thanks to the LED lighting! The wooden signs are a traditional décor item, giving off the look of being handcrafted. Ideal for that country Christmas feel, they are sure to please.